The weather man says that today, we will get a bit of a reprieve from the bitter cold we've been experiencing. Our little coastal Connecticut town might actually see 40 degrees Fahrenheit by this afternoon! But balmy day notwithstanding, we still have many weeks of winter ahead of us. Might as well embrace it, rather than curse our fate, right? What about some good, snowy books to curl up with in front of a fire? Paul O. Zelinsky of the New York Times has reviewed two snowy masterpieces for kids. 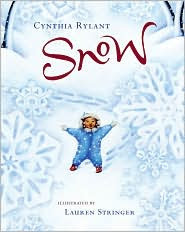 Snow, by Cynthia Rylant, is a twisting, turning poetic essay, spinning words and imagery like snowflakes on the wind. Illustrator Lauren Stringer brings to life a snowy day in a little girl's life. 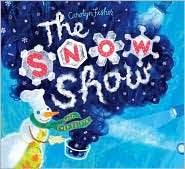 The Snow Show, by Carolyn Fisher is a silly story about a chef snowman with his own television show. He's cooking up a big batch of snow for all his viewers--and readers. So for now, we can curl up with our snowy stories, whiling away frigid afternoons. But if today's temperature is any indication, Spring can't be too far off now, can it?